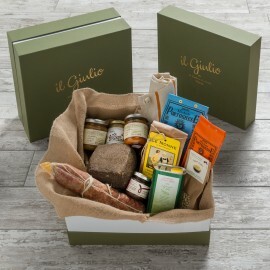 Enjoy the delightful taste of the Tuscan food, let us present a special gift: the traditional specialties enclosed in a box. Get the chance to smell their genuine and fascinating fragrances, open the box and recall your memories about your last holidays and wine vacations in Tuscany. The traditional Tuscan food is an authentic expression of the region and its culture, it enhances the simplicity, the essence of the hard daily work of the Tuscan people exalting Nature. A romantic wedding between perfumes and flavors, a sensual emotion that is renewed in the natural environment as in your kitchen. Live a new, charming, shopping experience, select the best Tuscan food specialties and organize a gourmet dinner with your guests (or just for two!). Serve on your table the delicacies from the Florentine countryside and from the farms of the famous Chianti area, give yourself a little pleasure that represents a perfect harmony with well-being and respect for life in general. 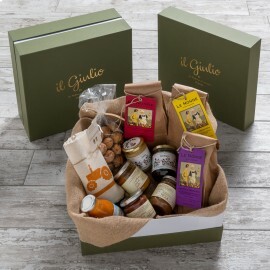 Choose your Tuscan box, taste your favorite traditional Tuscan specialties at home, live the atmosphere of the star restaurants, use the ingredients they usually cook, exalt the “made in Italy” with your recipes and feel part of the extraordinary Italian culinary tradition. What about some cheese and crackers as appetizers and then a classic “zuppa toscana”? Opening your ”wonderbox" you will appreciate the light fresh wind coming from the territory that stretches between Montecatini, Florence and Pisa, you will savor the rough and cozy notes of Chianti, you will find yourself immersed in the lush green of the olive groves. Open the box, close your eyes, you're in Tuscany. The place where the poet looks at the stars and the chefs sew them on their dress. "You can’t become a teacher in a day” and this is why every product you will find in this e-commerce is a symbol of a whole land and its people. Welcome to the portal of flavors of Tuscany, your starry food.